Gilderhus, Mark T. Senator Albert B. Fall and the Plot Against Mexico. New Mexico Historical Review 48 (October 1973): 299-311. 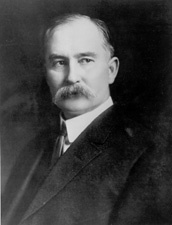 Joyce, Davis D. Before Teapot Dome: Senator Albert B. Fall and Conservation. Red River Valley Historical Review 4 (Fall 1979): 44-51. ___. Senator Albert B. Fall and the Treaty of Versailles. Proceedings of the Oklahoma Academy of Science 53 (1973): 136-44. ___. Senator Albert B. Fall and U.S. Relations with Mexico, 1912-1921. International Review of History and Political Science 6 (August 1969): 53-76. Nash, Gerald D. Albert B. Fall and United States Oil Policy in 1921: A Document. New Mexico Historical Review 67 (April 1992): 157-66. Owen, Gordon R. The Two Alberts: Fountain and Fall. Las Cruces, N.Mex. : Yucca Tree Press, 1996. Stratton, David H. Albert B. Fall and the Teapot Dome Affair. Ph.D. dissertation, University of Colorado, Boulder, 1955. ___. New Mexico Machiavellian? : The Story of Albert B. Fall. Montana 7 (October 1957): 2-14. ___. Two Western Senators and Teapot Dome: Thomas J. Walsh and Albert B. Fall. Pacific Northwest Quarterly 65 (April 1974): 57-65. ___, ed. The Memoirs of Albert B. Fall. Southwestern Studies, vol. 4, monograph no. 15. El Paso: Texas Western Press, 1966. Trow, Clifford Wayne. Senator Albert B. Fall and Mexican Affairs: 1912-1921. Ph.D. dissertation, University of Colorado at Boulder, 1966. ___.  Tired of Waiting: Senator Albert B. Falls Alternative to Woodrow Wilsons Mexican Policies, 1920-1921. New Mexico Historical Review 57 (April 1982): 159-82. Weisner, Herman B. The Politics of Justice: A.B. Fall and the Teapot Dome Scandal: A New Perspective. Albuquerque, NM: Creative Designs, 1988. Woodward, Earl F. Hon. Albert B. Fall of New Mexico: The Frontiers Fallen Star of Teapot Dome. Montana 23 (January 1973): 14-23.